Politico.com reported today that the national track and trace addendum that many hoped would be made part of the Prescription Drug User Fee Act (PDUFA) of 2012 was rejected by the U.S. House and Senate Conference Committee. That committee is working on merging the differences between the versions adopted by the two Houses of Congress into a single bill. See “’Track And Trace’ On Ice For Now” in Politico PULSE. Assuming there isn’t a last minute reconsideration, this means that the odds are now slim that a national regulation will preempt the California pedigree law before its effective dates. The remaining chance comes from the fact that the industry is well organized and well represented by the Pharmaceutical Distribution Security Alliance (PDSA) and could decide to back the introduction of a stand-alone bill that contains the essence of the Pharmaceutical Traceability Enhancement Code (RxTEC) language that was part of the PDUFA negotiations, or some other proposal. The success of such an approach likely depends on how close the negotiations were to an agreement when time ran out. In a widely read essay back in March I speculated what would happen if RxTEC wasn’t adopted by Congress this year. I highly recommend that you (re)read my essay called “What If RxTEC Isn’t Adopted?”. It was my longest essay yet so you might want to skip down to the last section where I speculate on what might happen next if the PDSA failed to get RxTEC attached to PDUFA. It may have more pertinence now that that is exactly what appears to have happened. When you’re done reading that, read my much shorter essays, “The Preemption Provisions Built Into The California Pedigree Law”, “California Enforcement Subcommittee Moves To Require FDA SNI” and “InBrief: FDA To Publish Track & Trace Standard By Year End” and decide for yourself how solid my theories are about what could happen next. It goes something like this. The FDA will publish their Track & Trace standard later on this year. California’s existing law could be interpreted as requiring the Board of Pharmacy to adopt the FDA’s standard for Track & Trace, just as it recently did for the FDA’s Standardized Numerical Identifier (SNI). In that case we might be looking at a completely different architecture for California ePedigree by the end of the year, one that could be viewed more favorably by some, less so by others. What do you think will happen? Leave your thoughts in a comment below. Dirk: Just interested in your opinion and certainly those of others as to whether the action by the conference committee and the potential that the RxTEC Act will now be on its own to try and get through Congress, create a stampede by the industry to the pedigree compliance door, or will people continue to believe that 1/1/2015 just will not happen? If companies legitimately want to wait to see what the FDA proposes through their Track and Trace guideline and how close it is aligned with or supports the California regulation, if that guideline is published in the 4th quarter, then as of January 1st we are two years out from the CA compliance date. And one could argue we are really 18-20 months out since one would assume that a company wants to finish all development, internal testing and external testing with its partners well before midnight on 12/31/2014 to ensure they do reach a state of confirmed compliance and operational readiness. When does the industry get serious and start moving, or is there such strong belief that California will cave again and push their date back to 1/1/2018 or whatever, that there is no need to panic today or by the end of this year? The industry consensus is that 1/1/2015 will not happen, can’t happen, so don’t worry about it. All great questions. I don’t know the answers. The California continues to be the only law that real and that requires manufacturers to do something special. That results in their efforts being spread “nationwide” since most of them don’t control the distribution of their drugs. All other state laws are aimed only at wholesale distributors who can comply with them by taking specific actions locally. This fact makes the efforts by manufacturers very significant and easy to underestimate. It appears the most larger manufacturers have been working toward compliance for some time now. Medium to smaller manufacturers with less work to do may be surprised to find that they are unable to line up the necessary external resources as it gets closer to the deadline. Looking back to the past events and what happened between 2007 and 2009 when there was a lot of activity to supposedly get ready for California, I think gives good insight to the future. Everybody wants to comply (obviously) but nobody wants to do it until they are sure that there is a good reason apart from the obvious of drug and patient safety. Many companies from what I hear have done evaluations and studies to see what they need to do to be ready, but ready for what? My own feeling is that this last round of government activity to get a National Standard in place was a real opportunity to take this initiative seriously but the political turmoil in Washington during an election year seemed to make this impossible to achieve. As for 2015 and California I believe that they will push for compliance by this date but as neither the drug companies nor the state want to be seen as the “bad-guy” and prevent needed drugs getting into the state, it will either be pushed out (again) or stopped by a legal challenge. In the long run if no National Standard gets pushed through I agree with Dirk that the de-facto standards for the states will be the FDA SNI recommendation and any accompanying rules for pedigree and general track and trace. This will at least allow the states and manufacturers to come into line with one another and hopefully define a standard going forward that everyone will be able to accept. 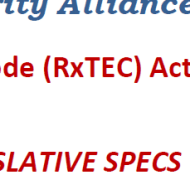 I’m not sure the failure of RxTEC was due to differences between our elected politicians so I don’t think you can blame it on “the political turmoil in Washington”. From my reading the elected officials were ready to adopt any proposal that the negotiating parties were able to agree on. Those parties included the PDSA, the FDA and the Pew Trust, representing patients. For example, see: “User Fee Bills Head Towards the Finish Line: Three Differences to Watch”. These parties were apparently unable to come to an agreement by the deadline that was imposed by the Conference Committee (the elected politicians). When the time expired without an agreement, the track & trace provision was removed from PDUFA. How likely any standalone effort might be successful is probably dependent on how close the negotiating parties were to agreement at the deadline. If they were close, maybe they just needed a couple more days. But if any party wasn’t really negotiating but instead was remaining intransigent, a standalone effort isn’t likely to work–unless perhaps this current failure has shaken the intransigent party into a softer posture. I don’t know which it was.